“Hell is empty… all the devils are here.” William Shakespeare — The Tempest. 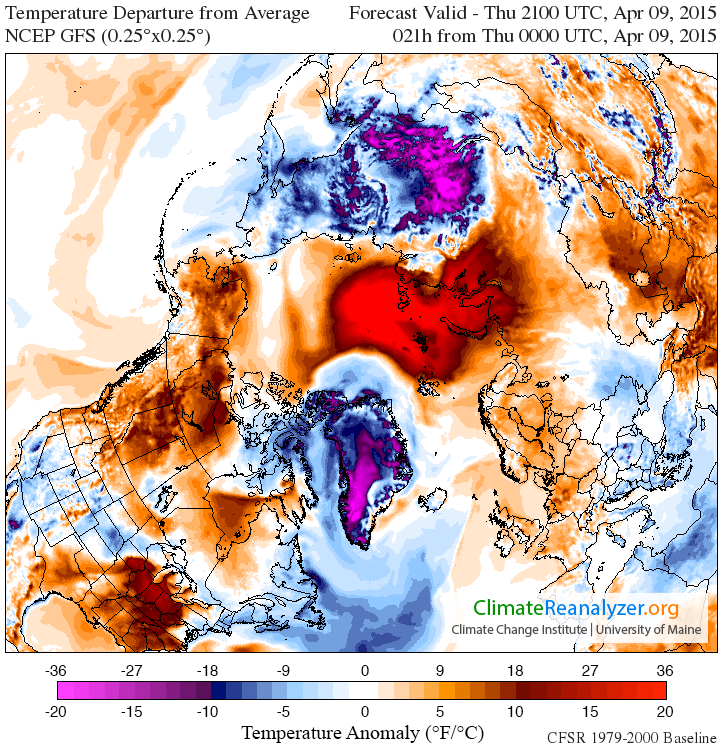 We have never seen heat like this before in the Arctic. Words whose meaning tends to blur due to the fact that, these days, such events keep happening over and over and over again. Ever since at least the 1920s, the Arctic has been warming up due to a destructive and irresponsible human greenhouse gas emission. 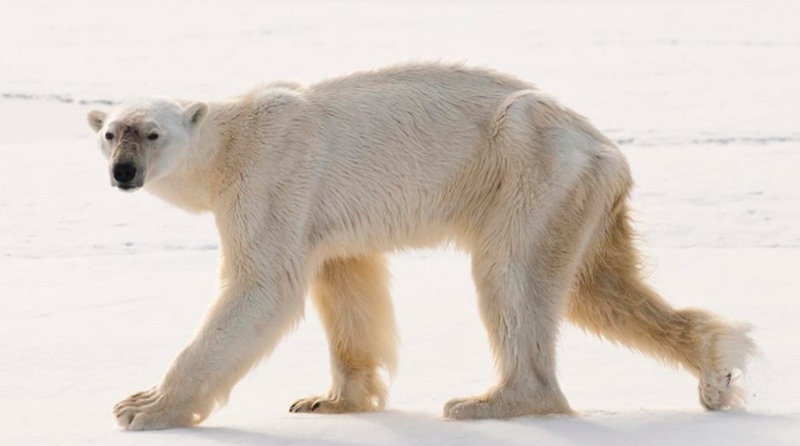 And, over recent years, the Arctic has been warming more and more rapidly as those dangerous emissions continued to build on into the 21st Century. 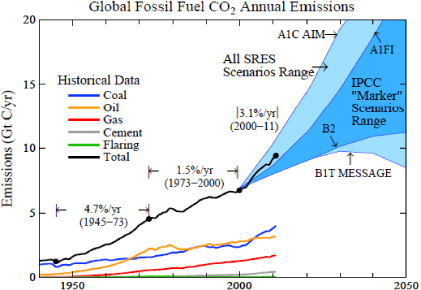 Now the Earth has been shoved by those emissions into realms far outside her typical Holocene context. And it appears that the Winter of 2016, for the Arctic, has been the hottest such year during any period of human-based record-keeping and probably the hottest season the Arctic has experienced in at least 150,000 years. 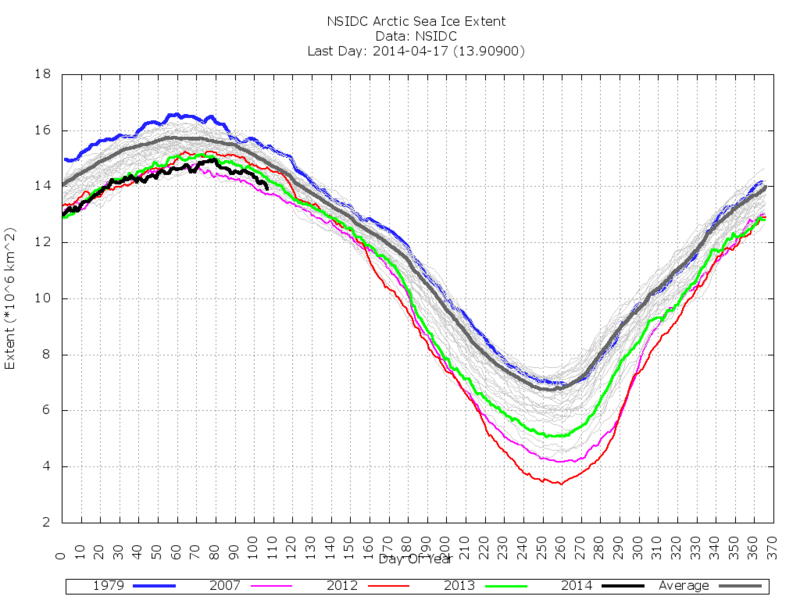 It’s just the most recent marker on a path toward an ever-worsening polar heat that is becoming all-the-more difficult to ignore or deny. 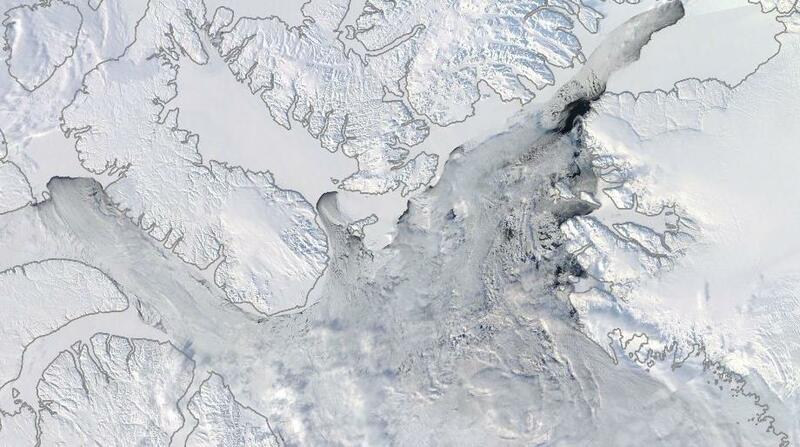 For at current greenhouse gas levels, that polar zone is hurtling toward temperatures not seen in 15 million years. A heat pressure that will push for warming not seen in 20, 30, 50 million years or more, if a nightmarish fossil fuel burning continues. Nothing in the recent geological past can compare to the danger we are now in the process of bringing to bear upon our world. Not the Great Flood. 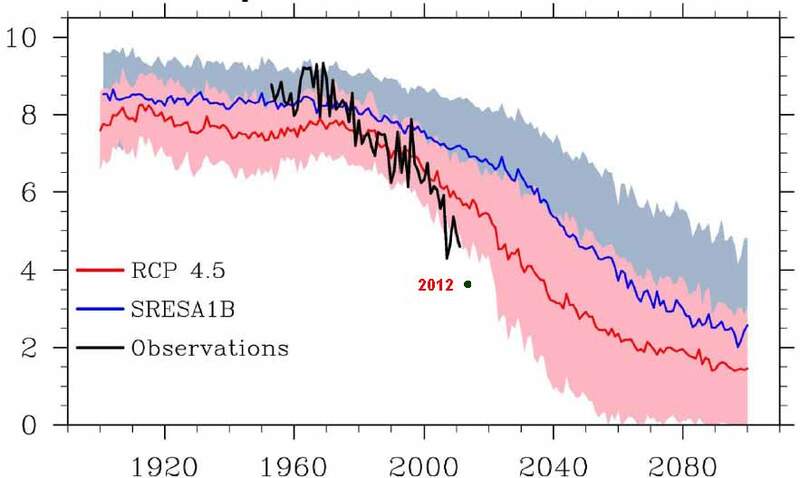 Not the end of the last ice age. Those were comfortable, normal cataclysms. Human beings and life on this world survived them. But the kind of geophysical changes we — meaning those of us who are forcing the rest of us to keep burning fossil fuels — are inflicting upon the Earth is something entirely new. Something far, far more deadly. At the start of 2016, we find ourselves experiencing a year during which our world is steepening its ramp-up toward this kind of catastrophic global heat. 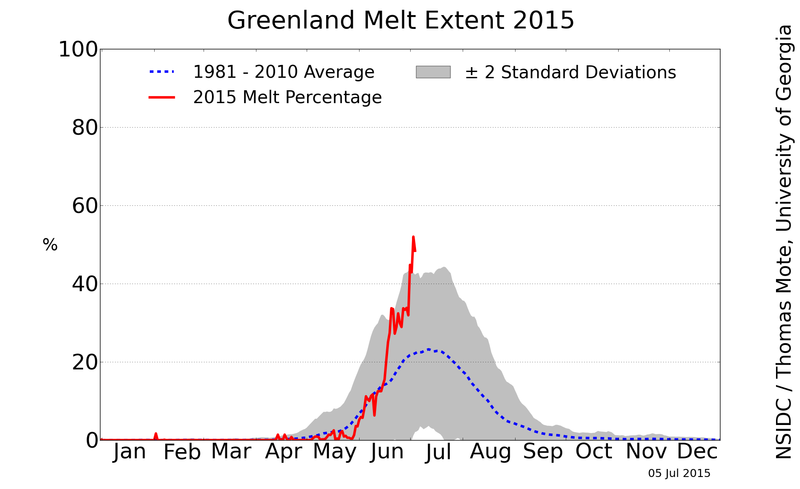 During January of 2016, the Arctic experienced its most extreme temperature departures ever recorded. February, it appears, was at least as bad. Today, daily temperature departures for the Arctic in the Climate Reanalyzer measure were a stunning +7.06 above an already hot 1979-to-2000 baseline (see graphic above). To put this in perspective, a region larger than 30 million square kilometers or representing fully 6 percent of the Earth’s surface was more than 7 degrees Celsius hotter than average today. That’s an area more than three times larger than the United States including Alaska and Hawaii. 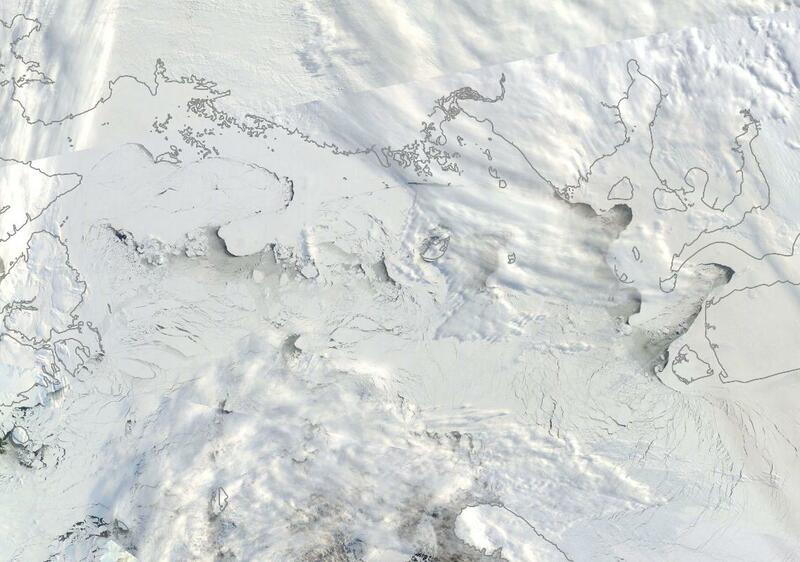 A region of the world that includes a vast majority of the remaining frozen Northern Hemisphere land and sea ice. 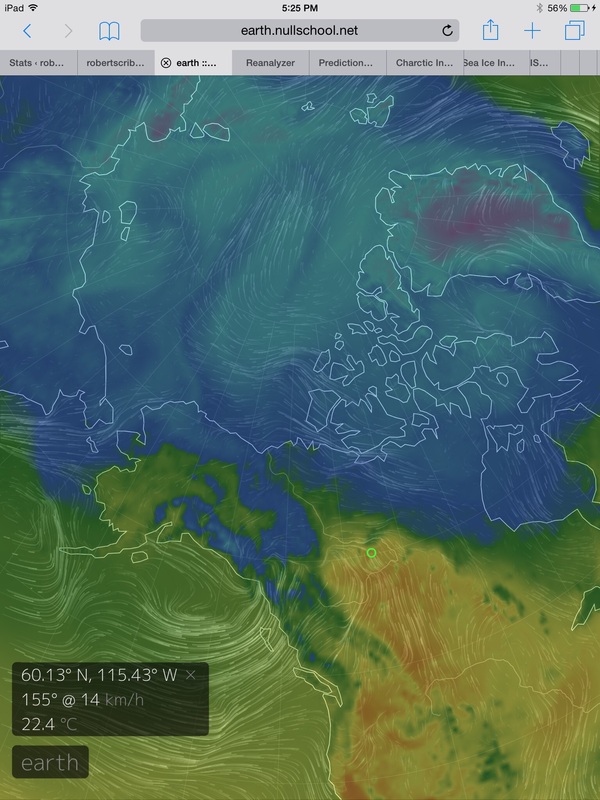 And since an extreme heatwave is typically defined as temperature departures at about 3 C above normal for an extended period of time over a large region — the Arctic appears to be experiencing some ridiculously unseasonable temperatures for this time of year. Above the 80 North Latitude line, departures were even more extreme — hitting about 13 C or about 23 F warmer than normal for the entire High Arctic surrounding the North Pole today (see above graphic). 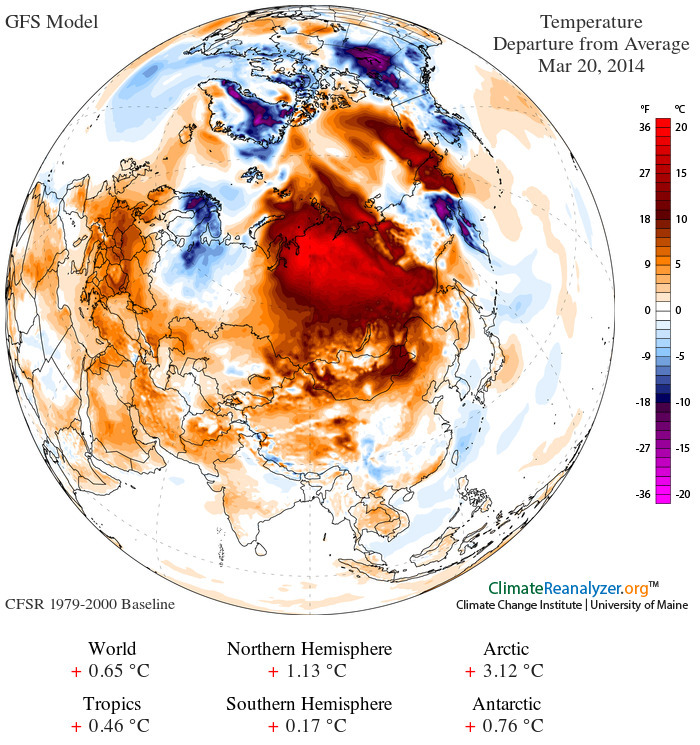 Temperatures that are more typical for late April or early May as we enter a time of year when this region of the Arctic is usually experiencing its coldest readings and sea ice extents would normally continue to build. Unfortunately, today’s extreme heat was just an extension of amazing above average Arctic temperatures experienced there since late December. So what we are seeing is consistently severe Arctic warmth during a season that should be Winter, but that has taken on a character more similar to a typical Arctic Spring. 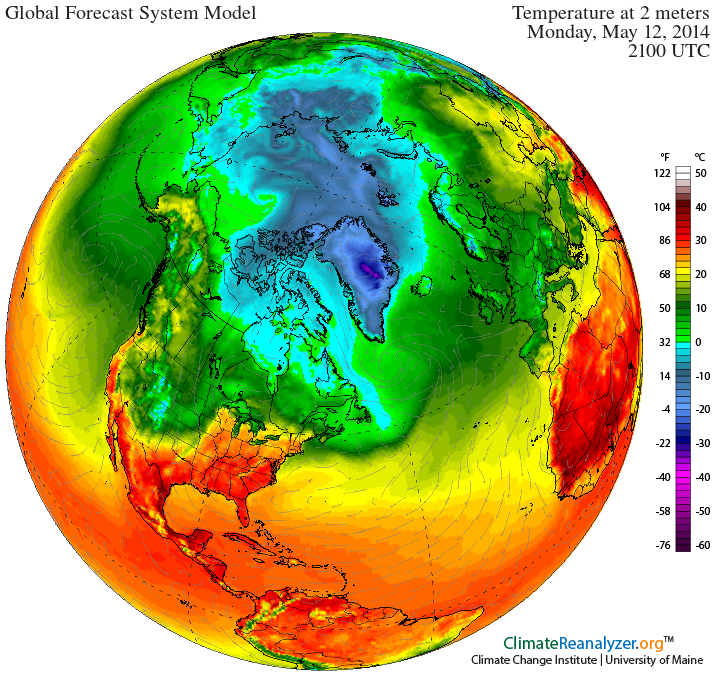 Warmth that is now enough to have already propelled the Arctic into its warmest ever yearly temperatures when considering a count of below freezing degree days. Freezing degree-days (FDD) or thawing degree-days (TDD) are defined as departures of air temperature from 0 degrees Celsius. 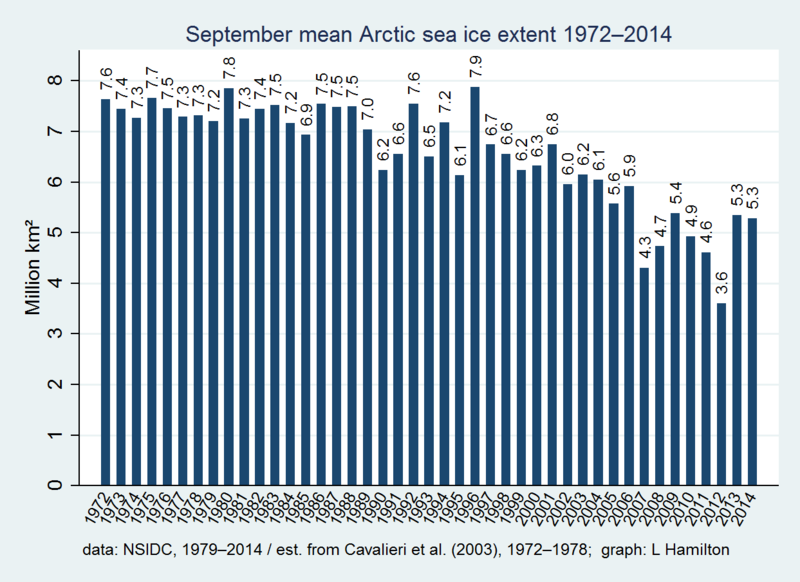 The less FDDs during an annual period, the warmer the Arctic has become. 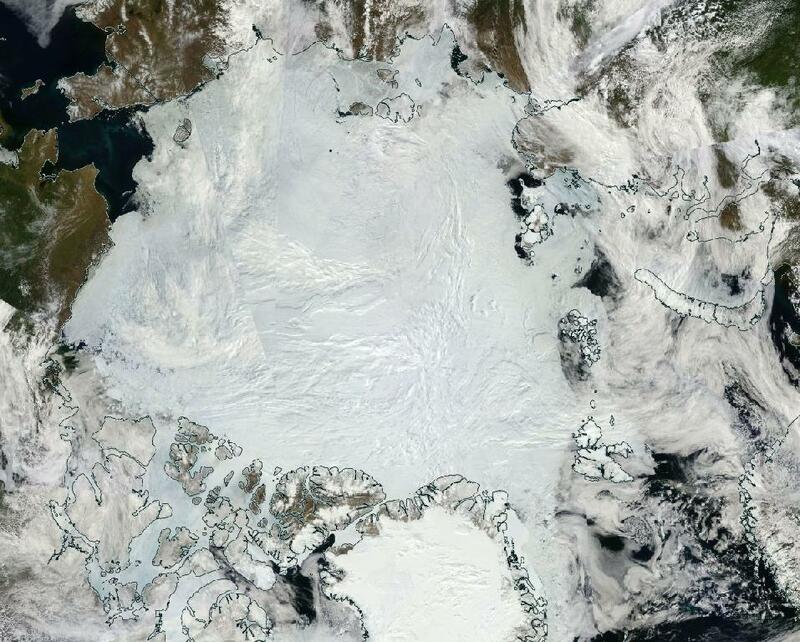 Under the current trend, the Arctic is now on track to hit between 15 and 25 percent less FDDs than it experiences during a typical year in 2016. Looking at the above graph, what we see is an ongoing period in which Winter cold has been hollowed out by a series of warm air invasions rising up from the south. 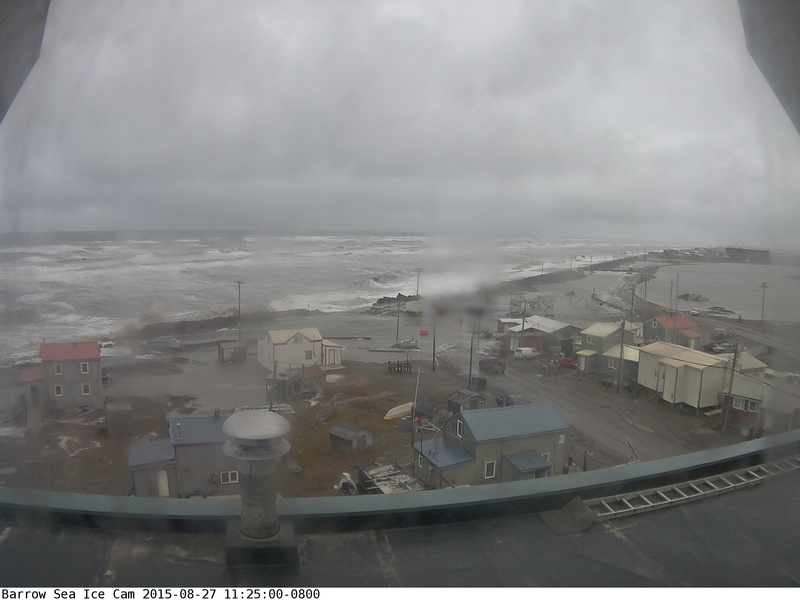 These warm wind events have tended to flow up through weaknesses in the Jet Stream that have recently begun to form over the warming Ocean zones of the Bering, Northeast Pacific, Barents, and Greenland seas. 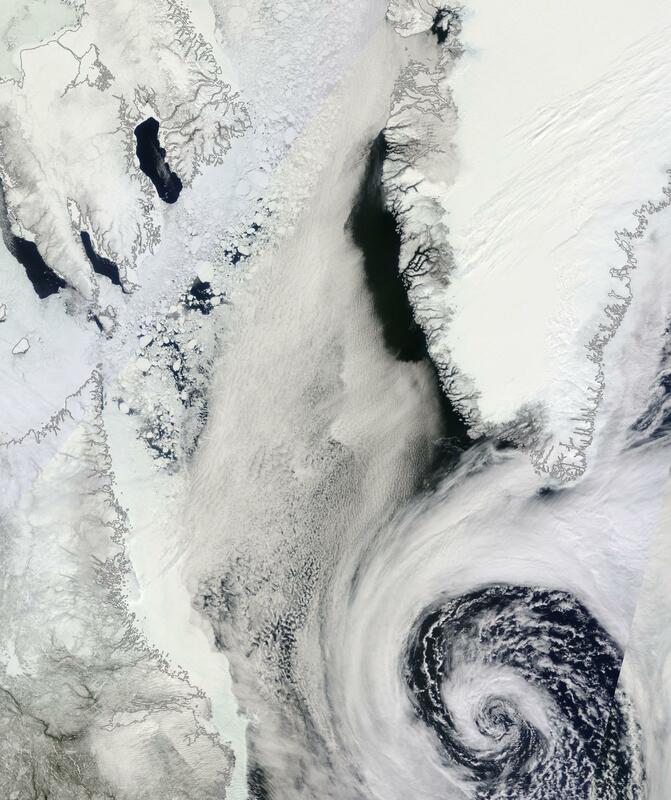 Still more recently, warm wind events have also propagated northward over Baffin Bay and Western Greenland — even shoving warm air into the ocean outlets of a typically frozen Hudson Bay. Perhaps more starkly, we find a steepening in the rate of Freezing Degree Day loss following the freakish series of storms that drove the North Pole above Freezing during late December of 2015 — the latest during any year on record that the North Pole has experienced temperatures exceeding 0 C.
Overall, a rapid heat uptake by the world ocean system appears to be the primary current driver of extreme Arctic warming. 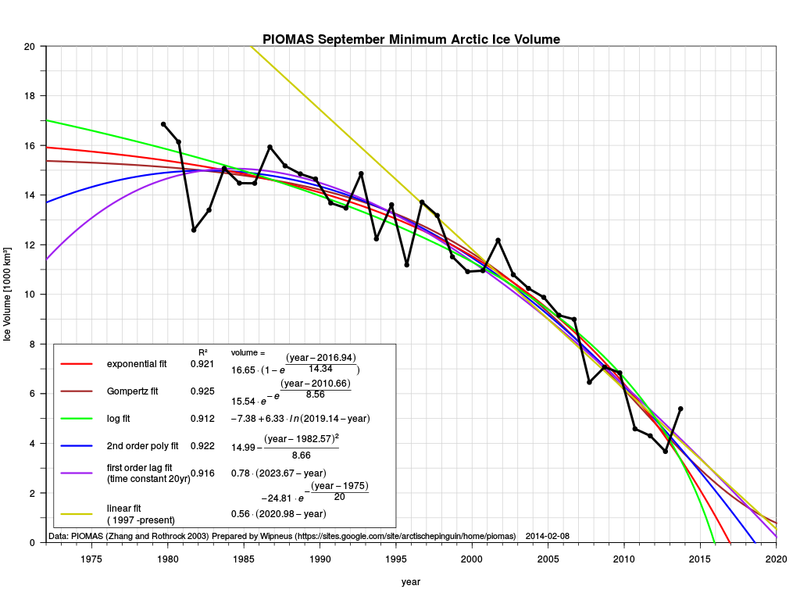 Atmospheric heat from greenhouse gas warming swiftly transfers through the ocean surface and on into the depths. During recent decades, the world ocean system has taken in heat at a rate equal to the thermal output of between 4 and 5 Hiroshima-type bombs every second (with some individual years hitting a much higher rate of heat uptake). Since thousands of meters of warming water insulates better than the land surface and diaphanous atmosphere, this added heat is distributed more evenly across the globe in the world ocean system. 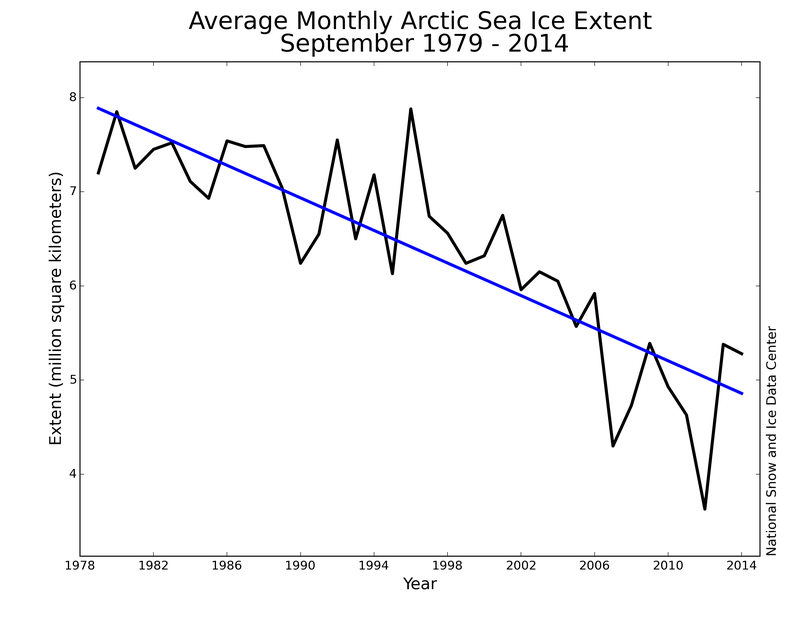 As such, ocean warming is a very efficient means of transferring heat to the Northern Hemisphere Pole in particular. 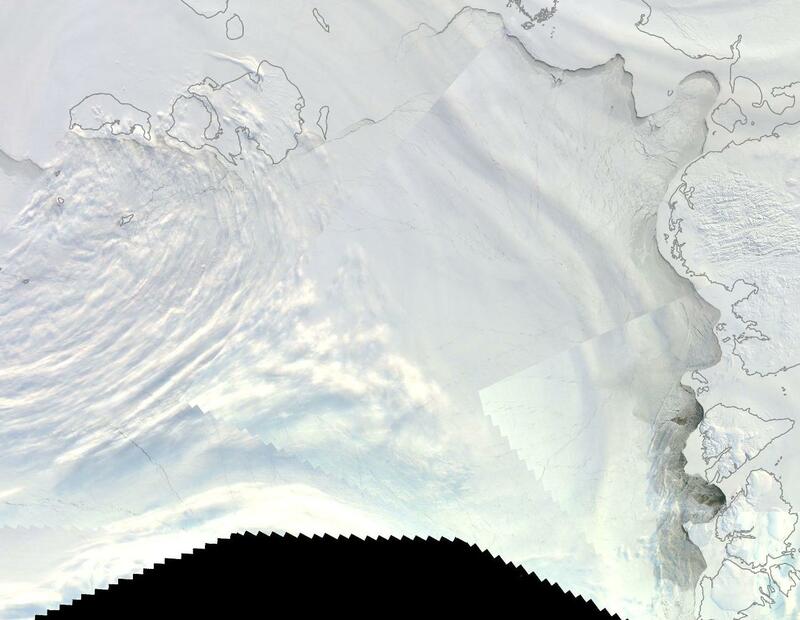 The reason is that the Pole itself sits atop the warming and globally inter-connected Arctic Ocean. 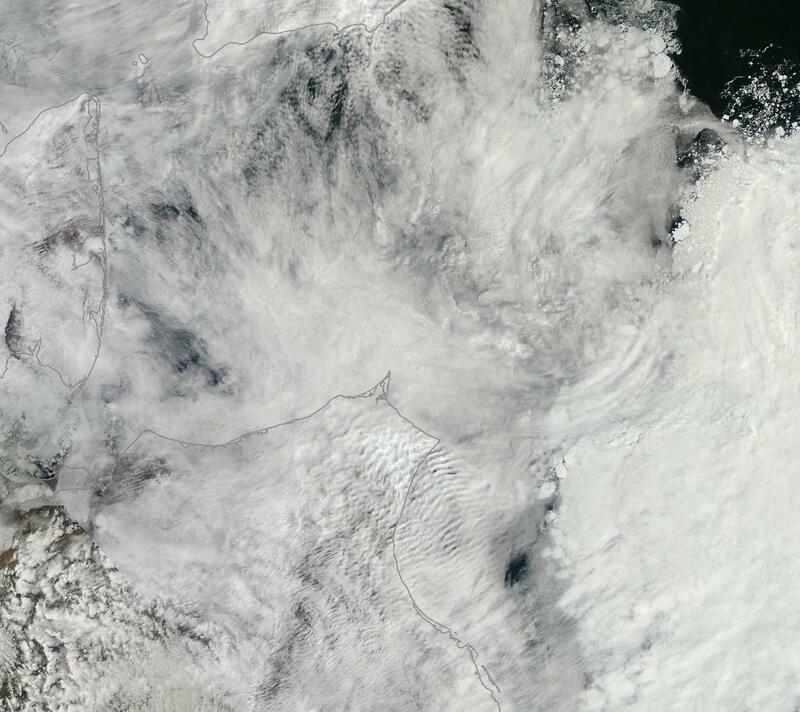 In addition, the warming surface waters, as noted above, provide pathways for warm, moist air invasions of the Arctic — especially during Winter. 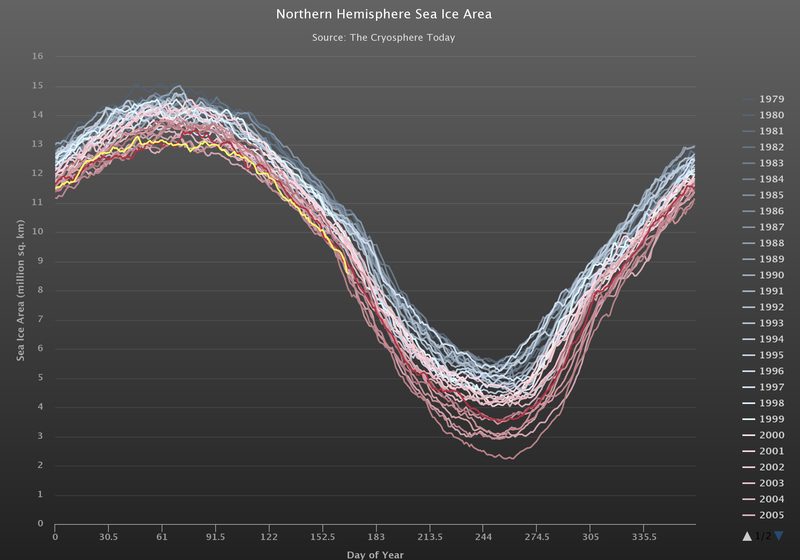 For 2016, these kinds of heat transfers not only resulted in an extreme warming of airs over the Arctic, they have also shoved the Arctic sea ice into never-before-seen record lows for area and extent. Off and on throughout January, but more consistently since early February of 2016, Arctic sea ice has continued to hit new daily record lows. 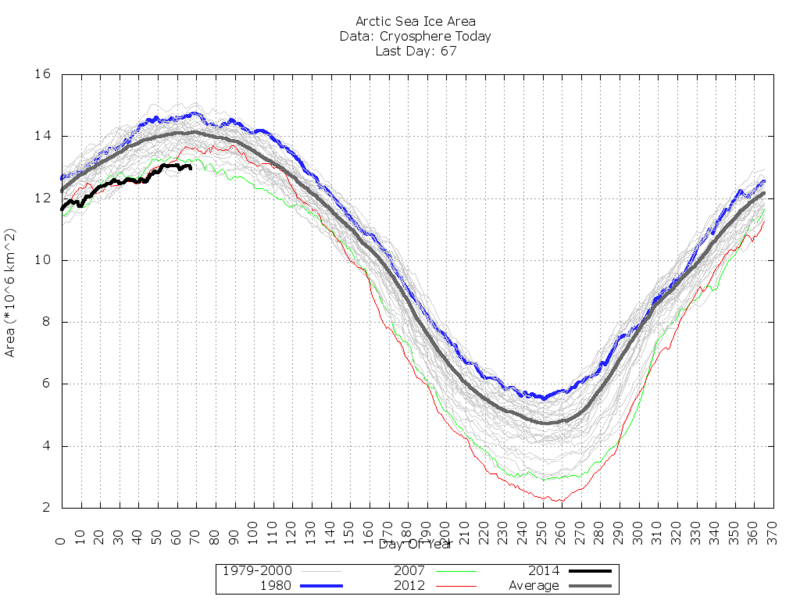 For Arctic sea ice extent, the record lows entered a streak that has now been unbroken since February 2nd. 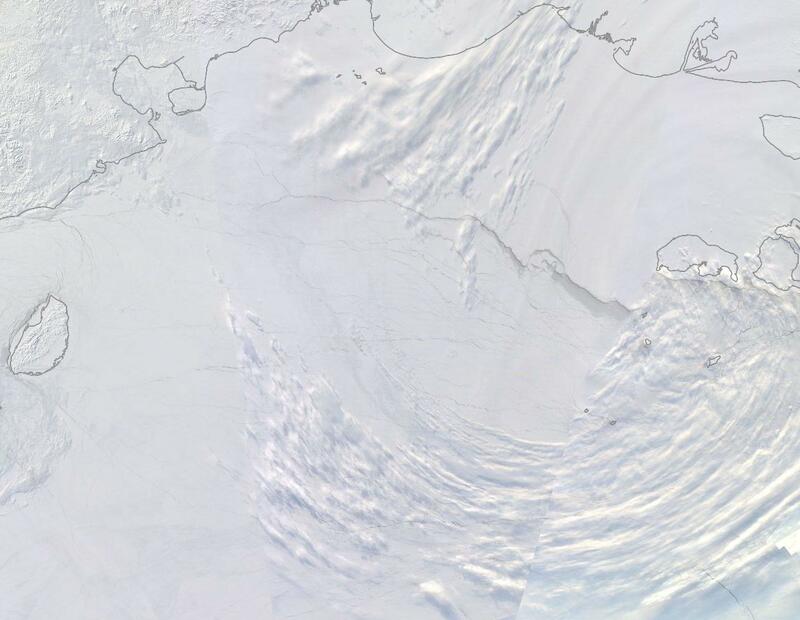 By the 21st, extent measures had hit 14.165 million square kilometers in the National Snow and Ice Data Center measure. 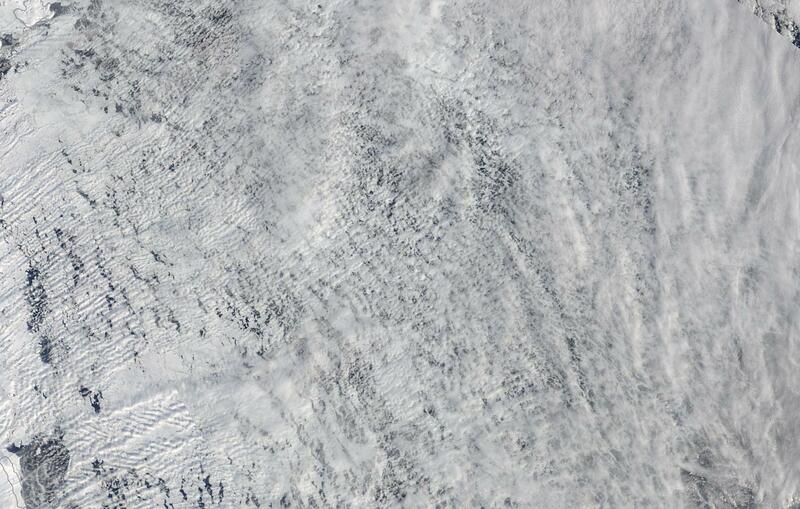 That’s about 200,000 square kilometers below the previous record low extent value for the date set during 2006. Perhaps more ominously, the current measure appears to have fallen off by about 50,000 square kilometers from a peak set on February 9th. And with such extreme heat driving into the Arctic over recent days, it appears that this departure gap could widen somewhat over the coming week. 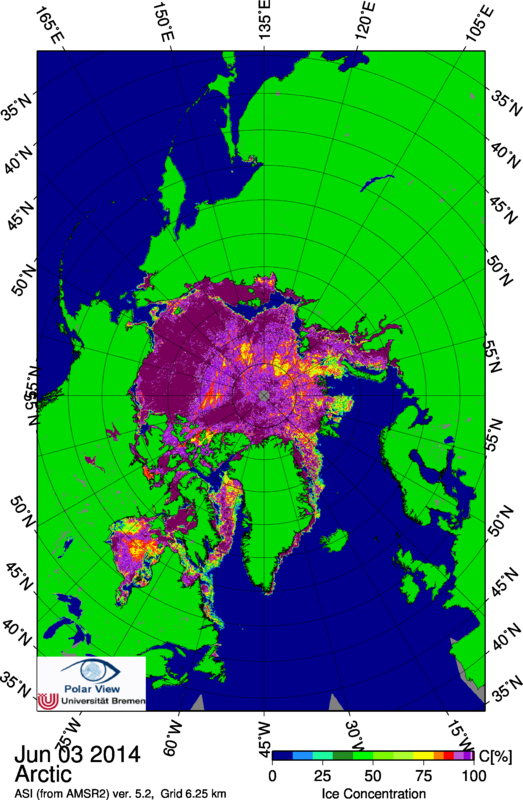 Overall, radiation balance conditions for the Arctic are starting to change as well. 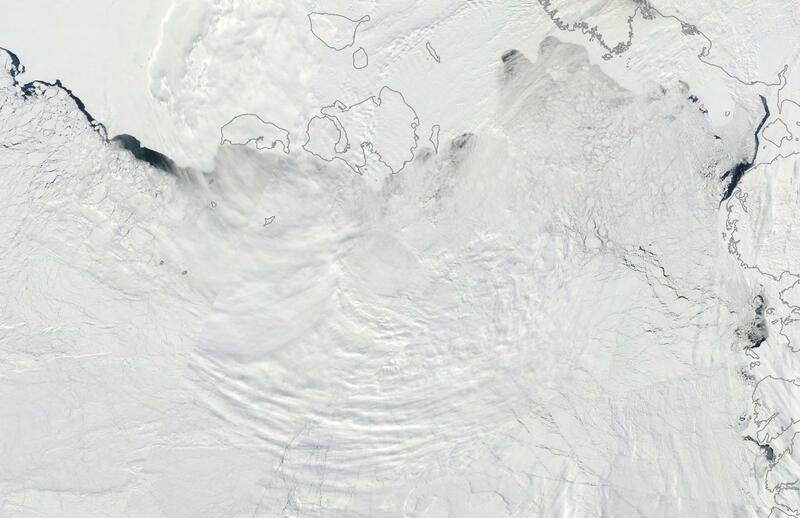 The long polar night in the Arctic is beginning to recede. 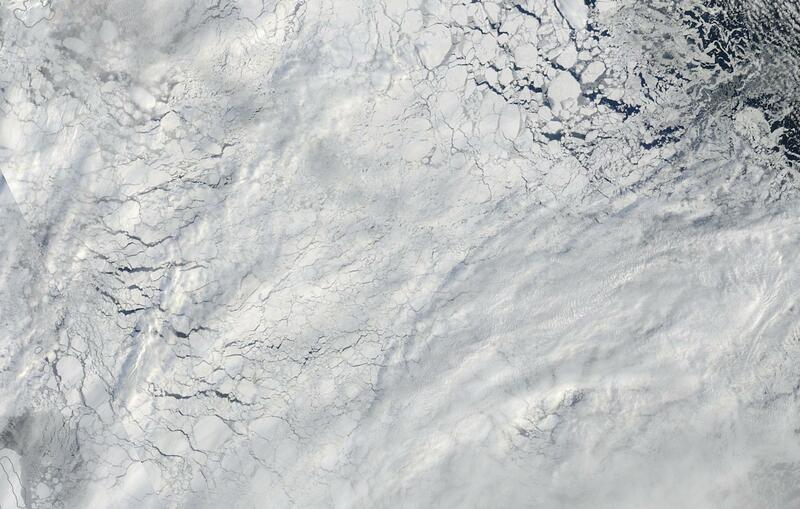 Sunlight is beginning to fall at very low angles over the sea ice, providing it with another nudge toward melting. 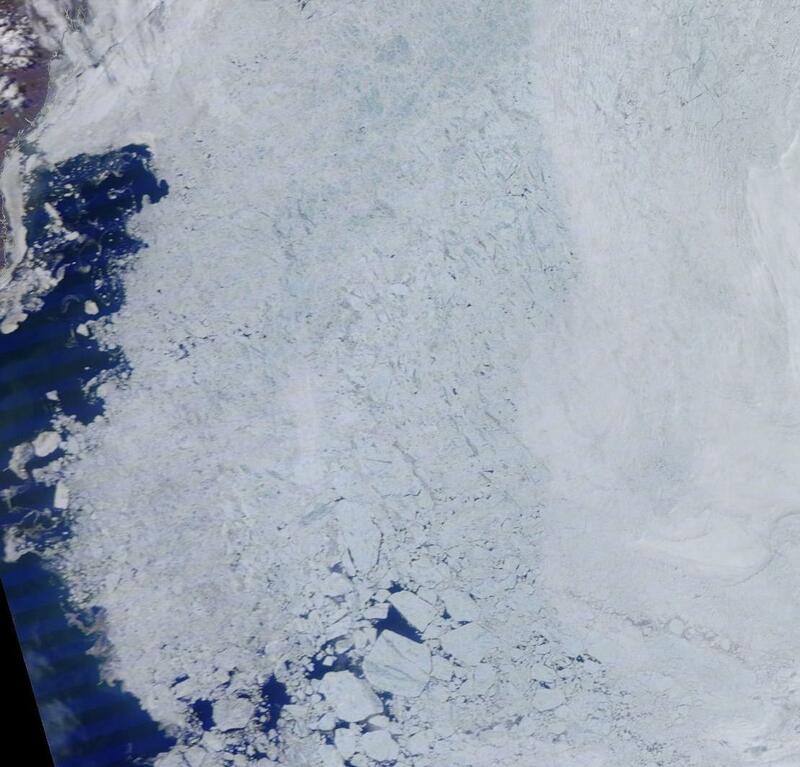 Finally, the greatly withdrawn ice has uncovered more dark ocean surfaces that will, in turn, absorb more sunlight as the Arctic Winter proceeds on toward Spring. 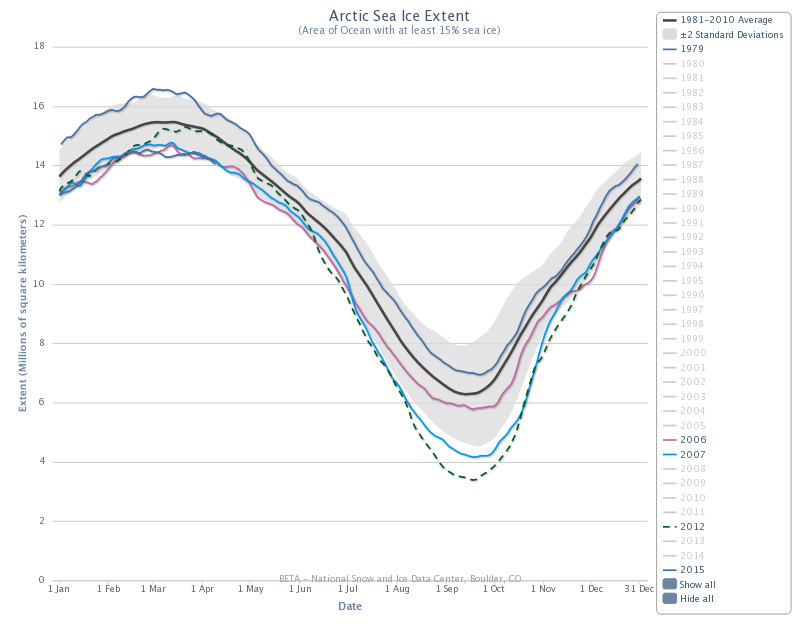 With sea ice declining slightly since February 9, with record warmth already in place in the Arctic, and with the sun slowly beginning to provide its own melt pressure, it appears risks are high that we see a record early start to Arctic melt season. Seven day forecasts do show high Arctic temperature departures receding a bit from today’s peak at around 6-7 C above average to between 4 and 5 C above average by the start of next week. But heat at the ice edge in the Bering, Barents, Greenland Sea and Baffin Bay are all likely to continue to apply strong pressure on sea ice extent and area totals. 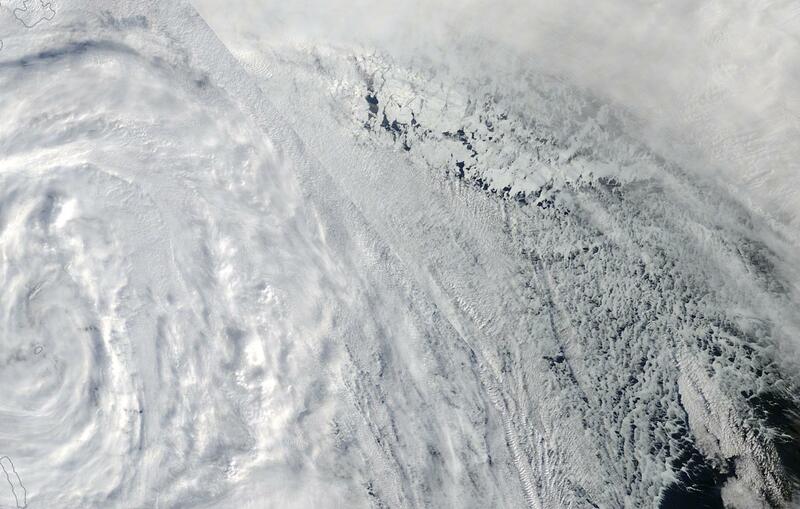 In addition, recent fracturing within the Beaufort has generated a number of low albedo zones that will face a wave of unseasonable warmth riding up over Alaska during the coming days which will tend to slow rates of refreeze even as Western Alaska’s waters feel the heat pressure of off and on above freezing temperatures. Could Lawsuit Against Exxon Mobile Force Fossil Fuel Industry to Pay for Lies about Climate Change? There’s a heatwave in Dickson, Russia today. 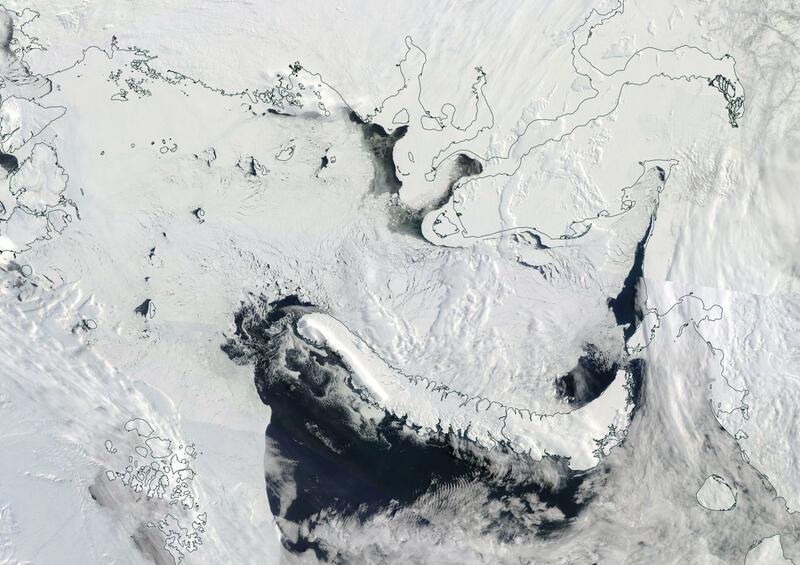 But if you were standing on the shores of this port city on the Kara Sea in the far north, you might not realize it. The forecast high? 29 degrees Fahrenheit. Dickson is located about 500 miles north of the Arctic Circle and 1,000 miles south of the North Pole. 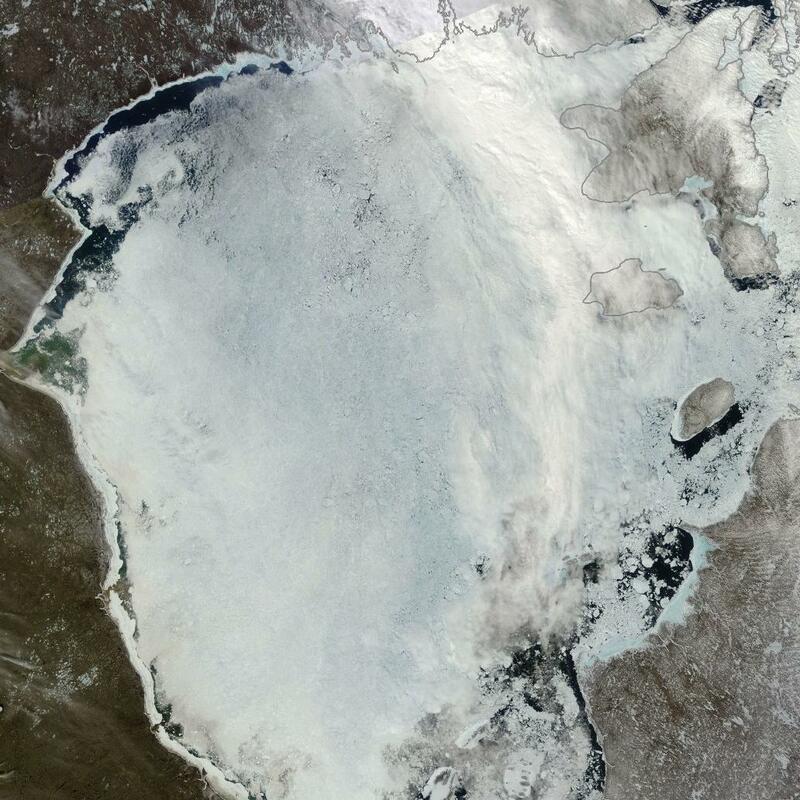 To its west is Novaya Zemlya, a sparely inhabited and typically frozen island between the Kara and Barents Seas. 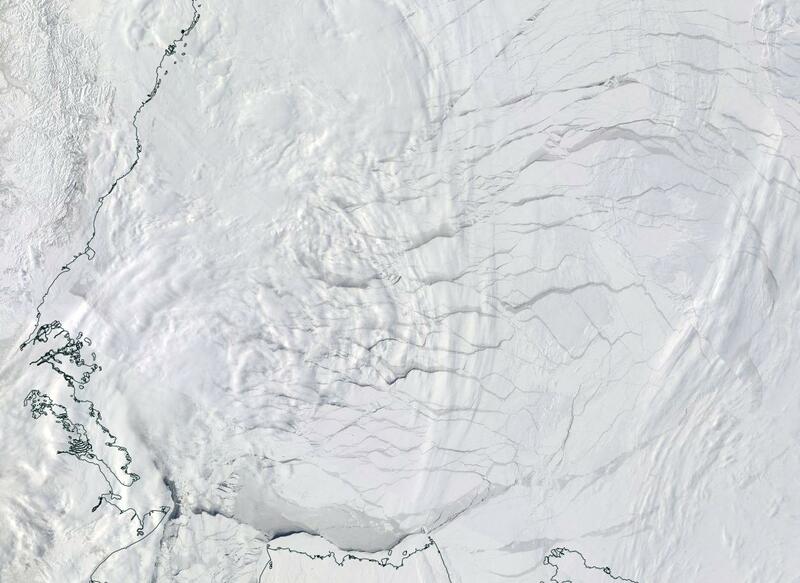 To its east is Siberian Khatanga and Severnaya Zemlya an island system that, until 2005, sat in a pack of Arctic sea ice so dense and resilient, it was once possible to ski from Severnaya all the way to the North Pole even at the height of Northern Hemisphere summer. No more. 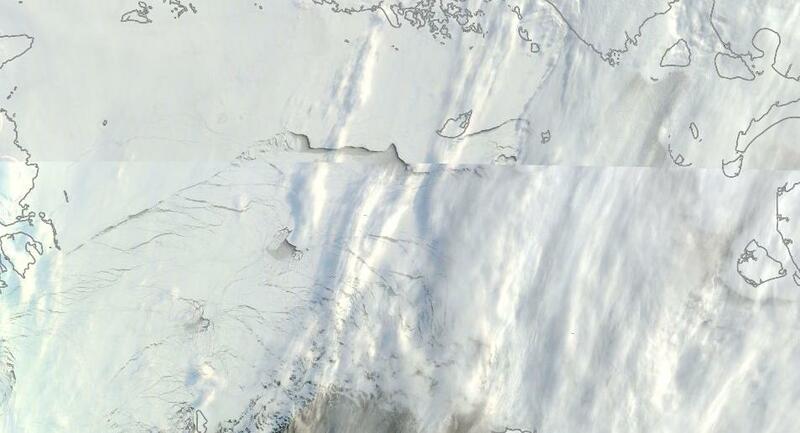 The sea ice is now but a thin and wrecked shadow of its former glory. Ask any resident of this, typically frigid, coastal town and they’ll tell you that today it’s abnormally warm, even hot for this far-north locale. For the average high for this day in Dickson is about 1 degrees Fahrenheit. Typical daily highs of 29 degrees (F) don’t normally appear in Dickson until mid-to-late June. 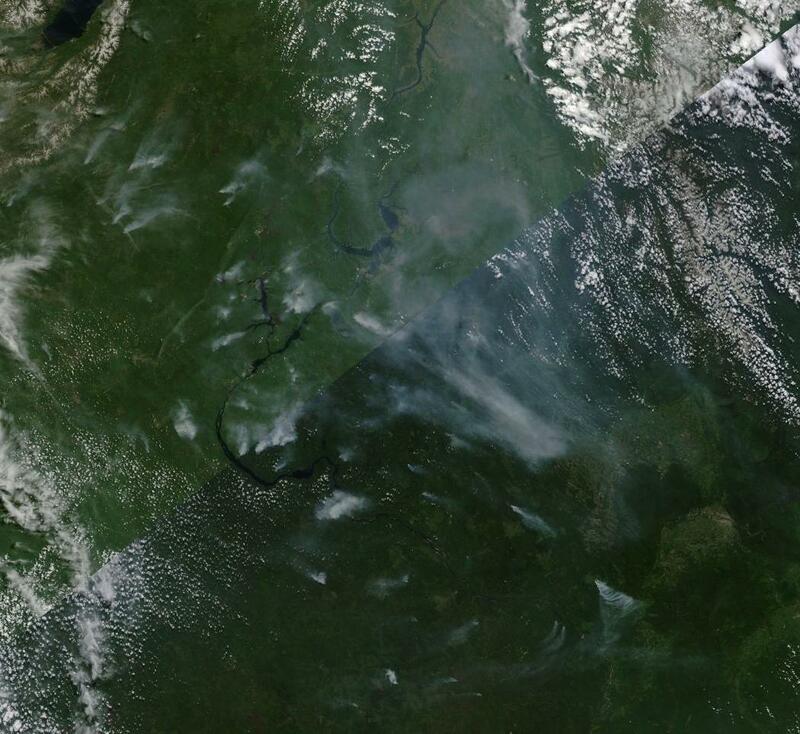 A heatwave extending from the Pacific Ocean in the east to the borders of Mongolia and China in the south. 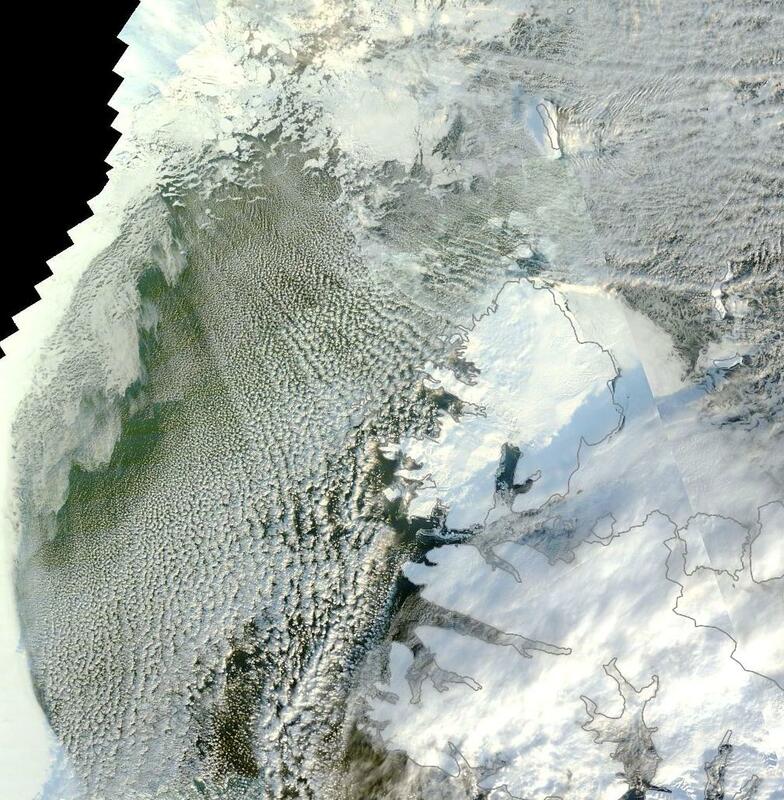 From Surgut in the west and on deep into the Arctic Ocean’s Laptev and Kara Seas in the far north. And it is vast, covering an area roughly 2,000 by 2,000 miles at its widest points. 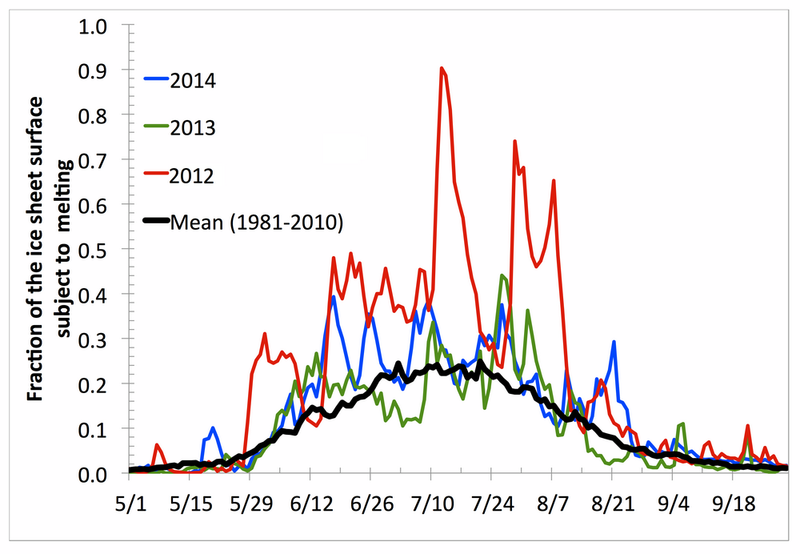 But the heatwave is not disassociated from other high temperature anomalies. 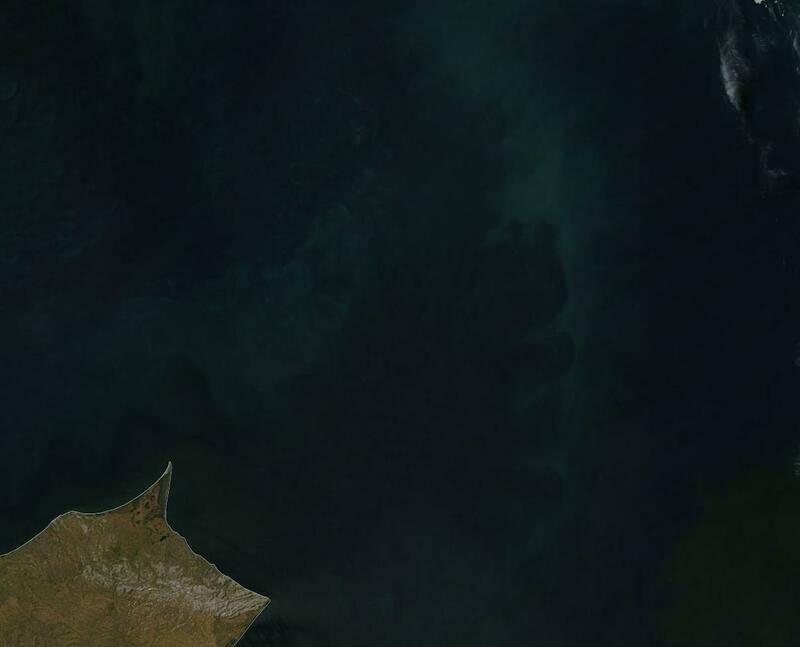 It flings a wide outrider over the Beaufort Sea and the Bering Strait. And it sits in a broad flood of warmer than average air riding over Europe, the Middle East and Asia. This Jet Stream entrained warm air feeds the heatwave even as pulses of much warmer than normal air rise up from the deserts of Western China over Mongolia and up into Russia to give it an added kick. 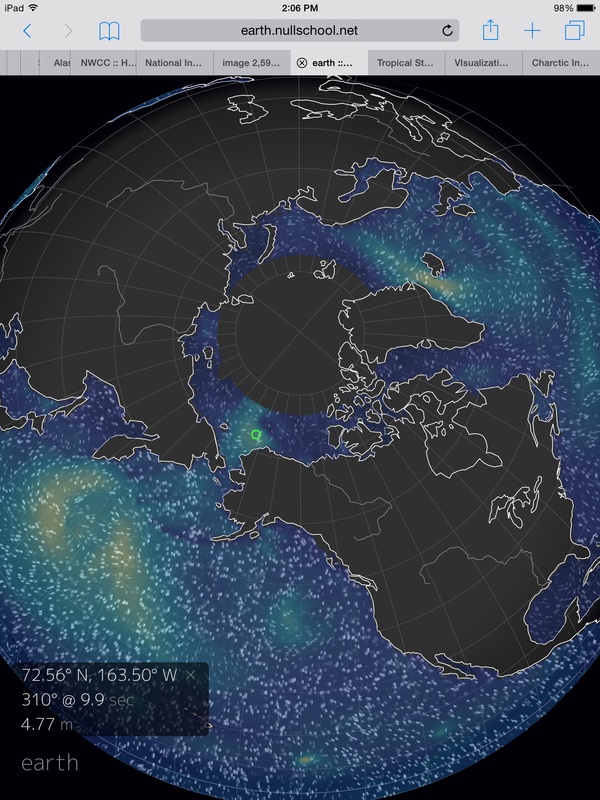 The connecting pattern is a high amplitude Jet Stream wave surging past the Arctic Circle and deep into the Arctic Ocean. It is the kind of high amplitude pattern that, over recent years, has been implicated in so many extreme Arctic heat invasions and related severe weather events. Temperatures in the far north of this hot zone range from 10 to over 36 degrees Fahrenheit above average for this time of year. 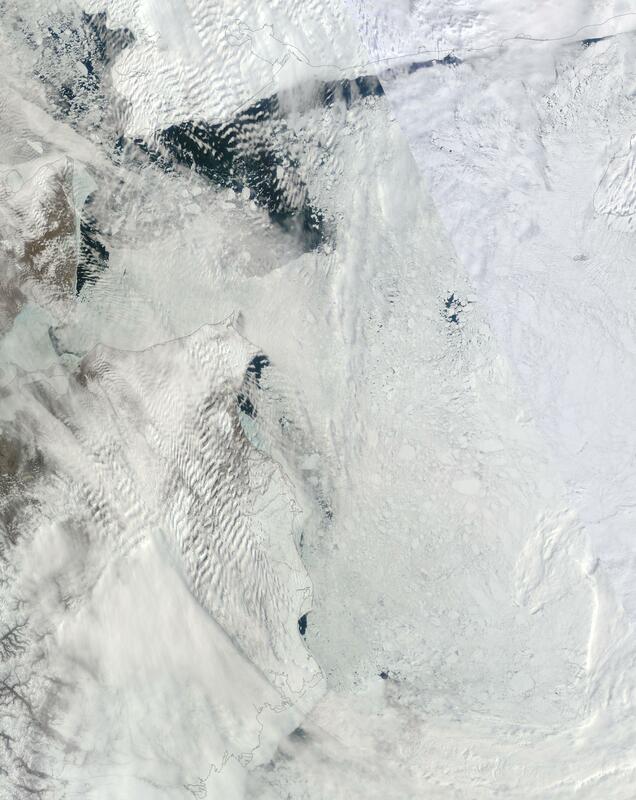 For Siberia and the Arctic Ocean it is a heatwave of just below freezing and slightly above freezing temperatures. In other words — what, until recently, used to be summer-like conditions. 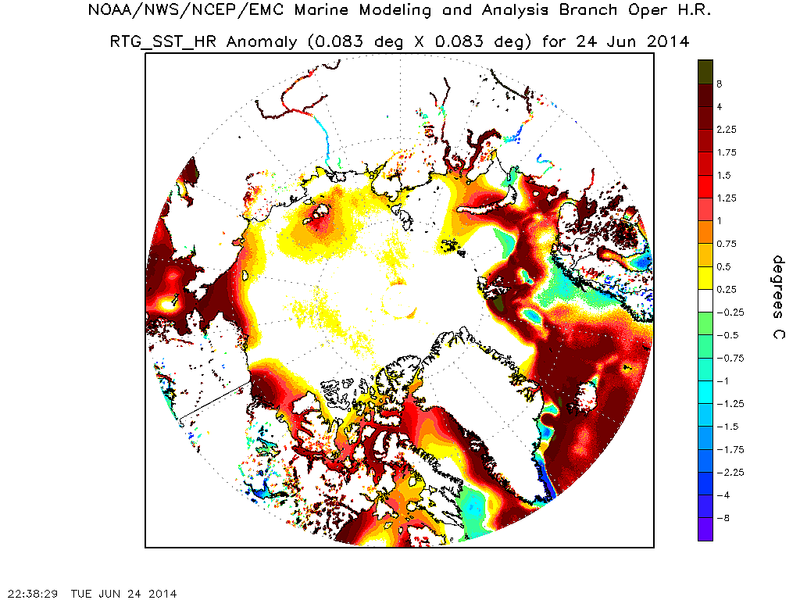 Such anomalous warmth is enough to put a heavy strain on sea ice. The ice freezes and melts at around 28 degrees F. So extended periods near or above this temperature can have an impact on ice integrity. 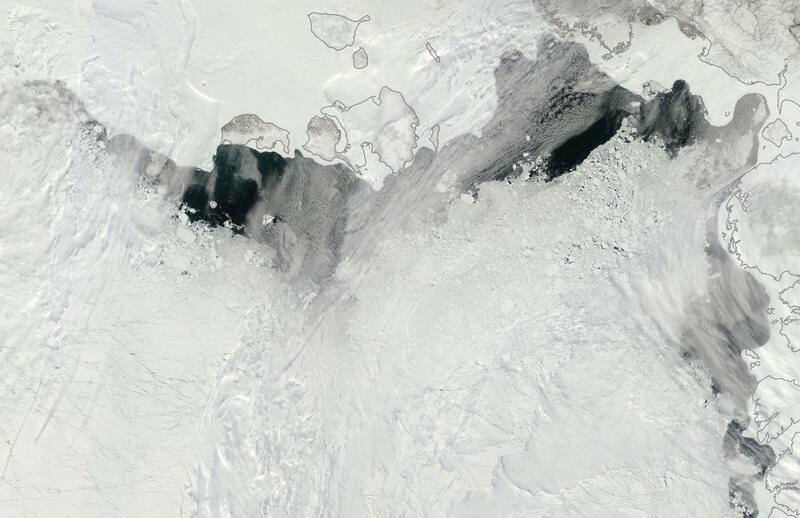 The ice gets hit by warmer air even as it floats over warmer waters. 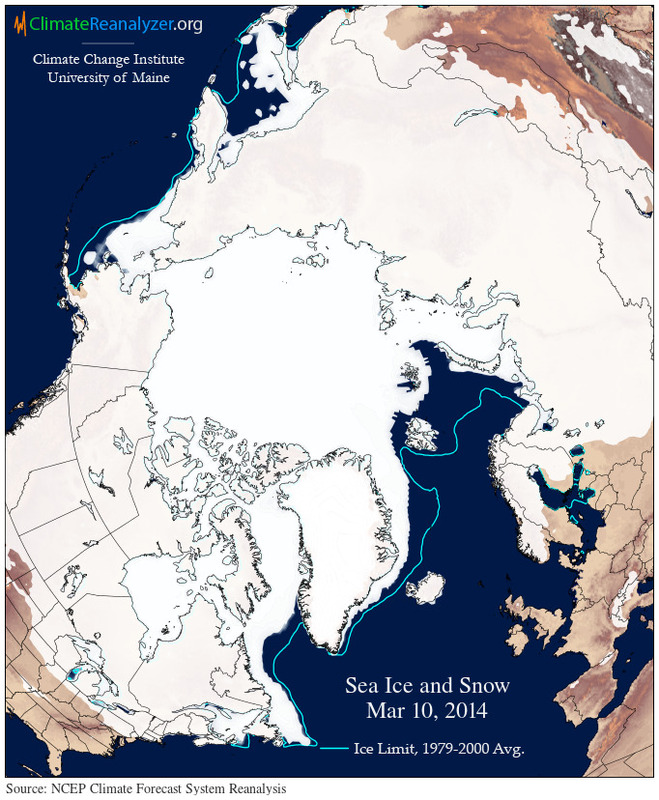 It’s a kind of one-two punch that can be pretty devastating to sea ice integrity. 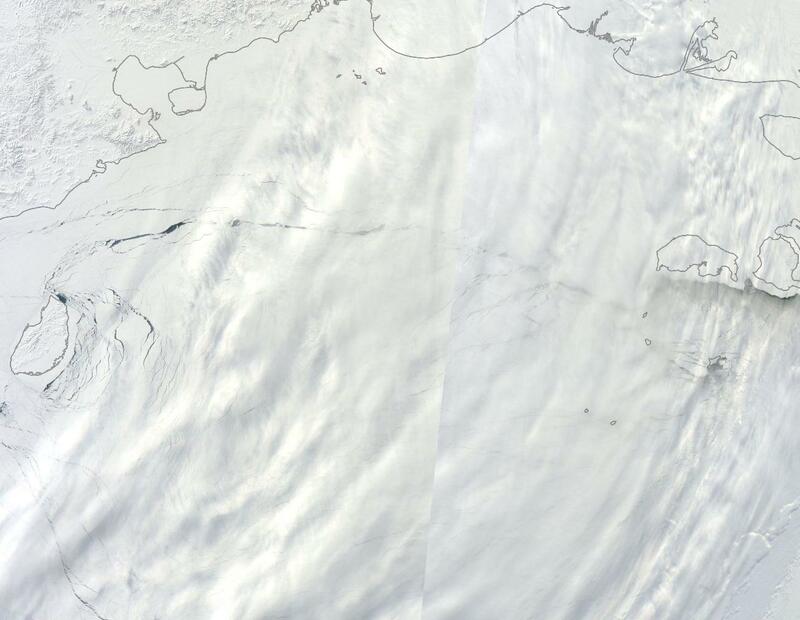 And we see just this kind of situation over the past two weeks in the region of the Kara Sea near Port Dickson. 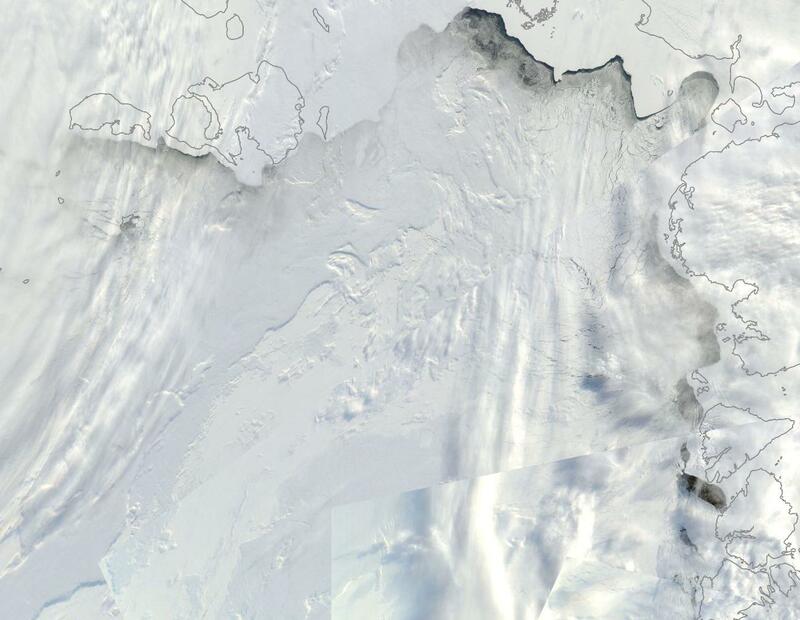 Normally, this frigid ocean zone is covered in a stable sheet of ice called land fast ice. 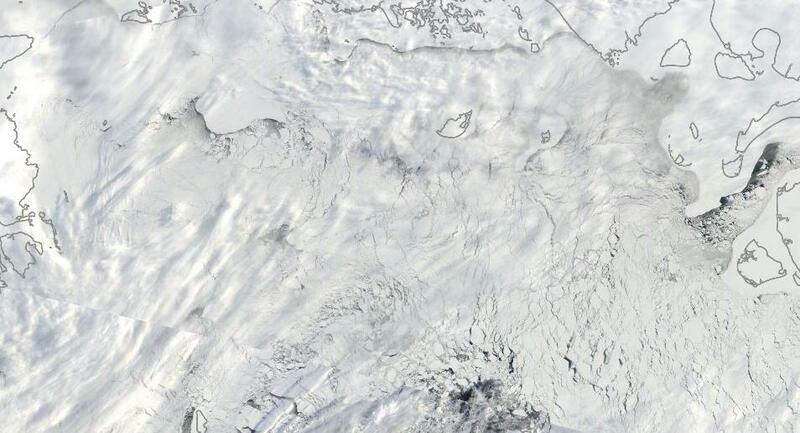 The ice is anchored to the land at various points and tends to remain solid due to reduced movement caused by grounding on the surrounding land features. 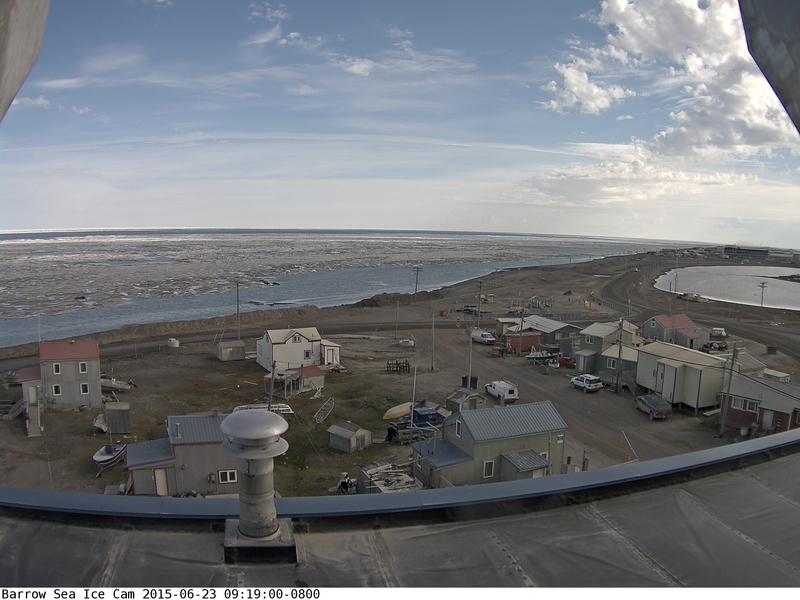 When the land fast ice starts to go, it usually presages melt. 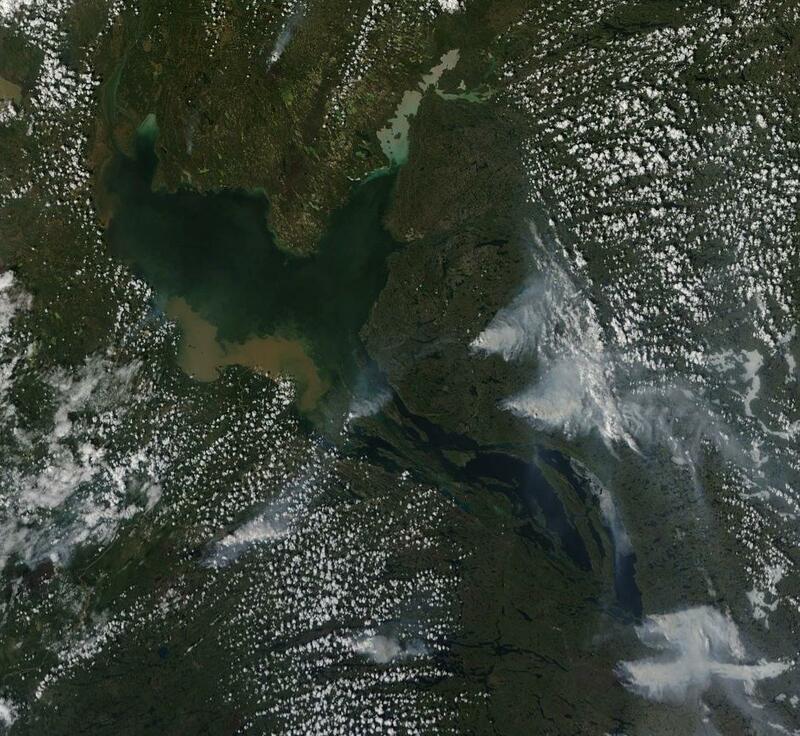 With the recent influx of much warmer than normal air from the south, this is exactly what we see. 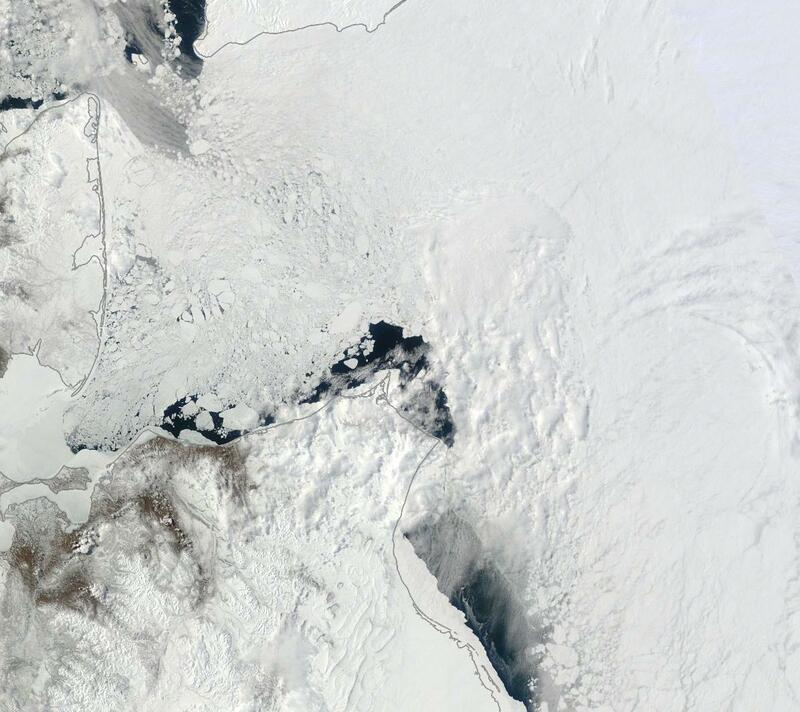 A widespread breaking up of Kara sea ice and of even the more resilient features fixed to surrounding lands and islands. 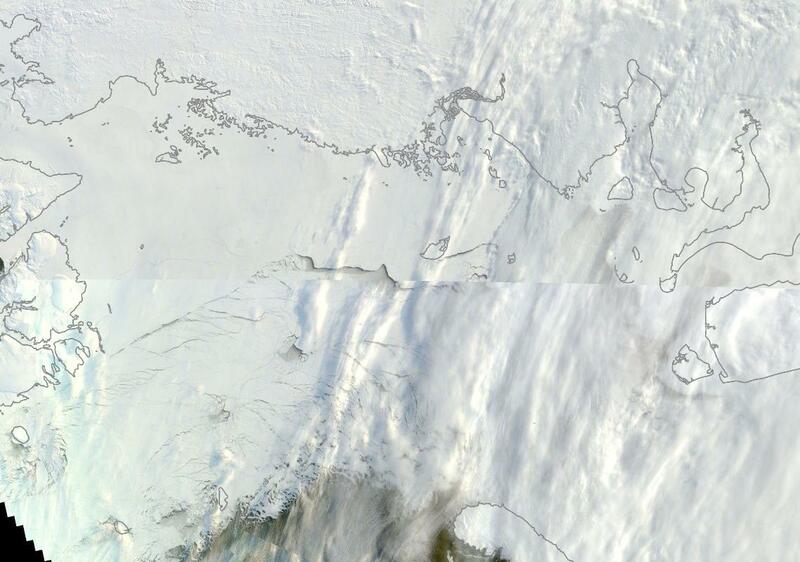 And as you can see in the lower frame image, the break-up is quite extensive and dramatic. The current warm pulse is expected to last for the next few days before shifting back to Svalbard by early to mid next week. 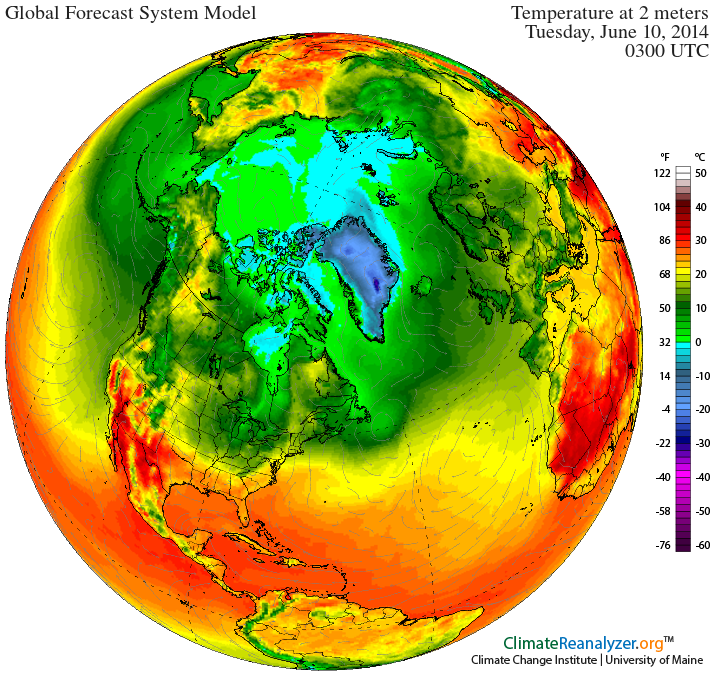 Meanwhile, overall Arctic temperatures are expected to remain between 2.5 and 5 C above the, already warmer than normal, 1979 to 2000 average all while a trend establishes that continues to feed warm air pulses up over Asia and into the Arctic Ocean zones of the Kara, Laptev and East Siberian Seas. 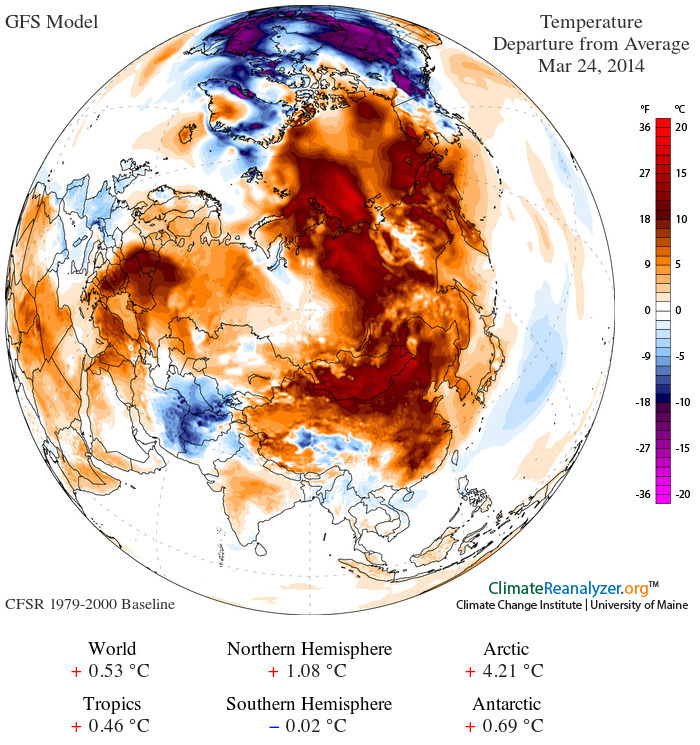 Abnormal warmth gathering over the continents in this way can cause both early melt and large flushes of warm meltwater into the Arctic Ocean. 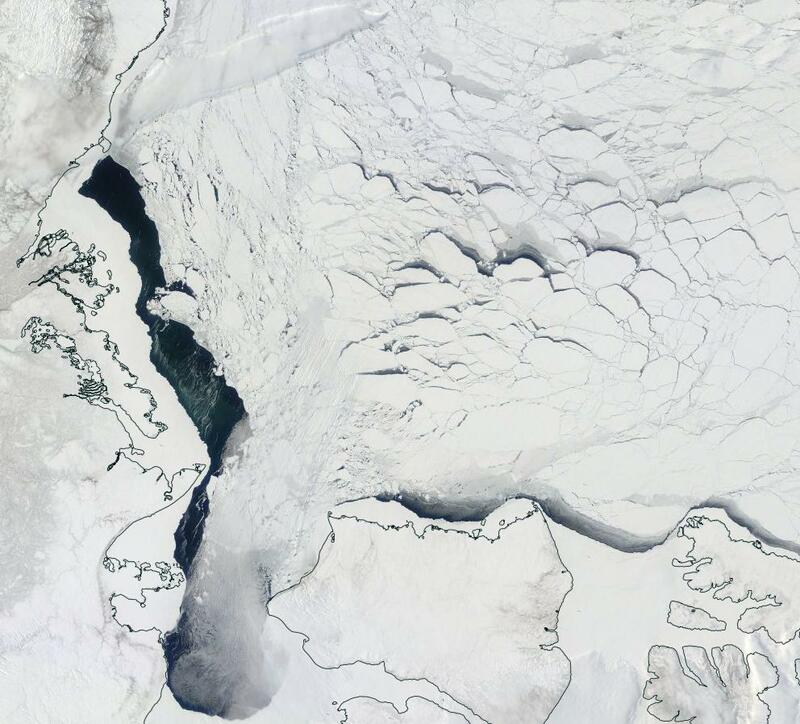 An issue that is specially relevant due to recent NASA studies of another section of the Arctic Ocean — the region north of Canada and the Mackenzie River Delta called the Beaufort Sea. 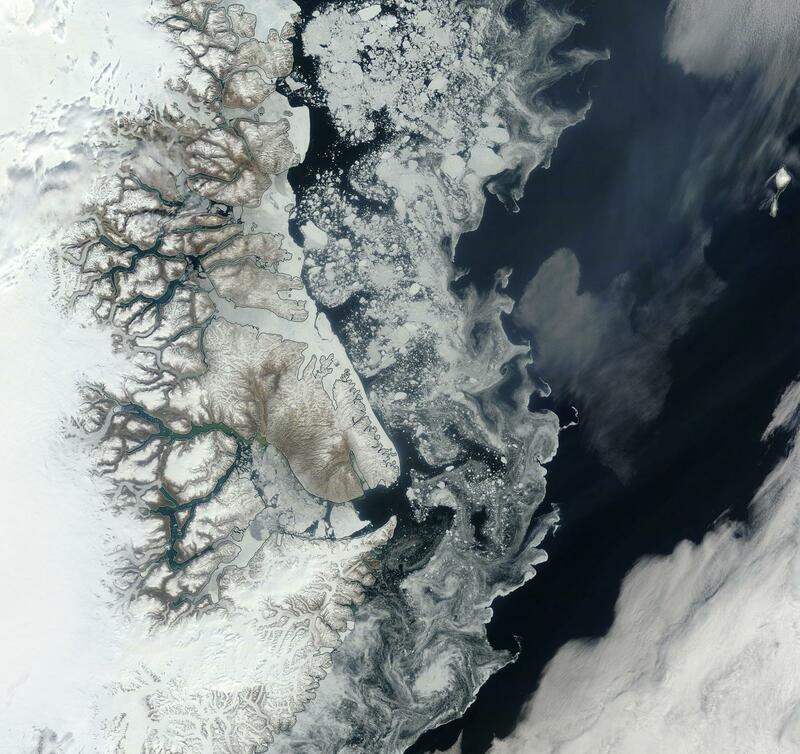 The NASA study found that large pulses of warm water from continental rivers are a strong mechanism for transporting heat into the Arctic and, over recent years, are one of many factors resulting in the sea ice’s rapid recession. The NASA study found that large heatwaves warmed the continents and that this caused continental rivers to disgorge warm water into an already warming Arctic Ocean. 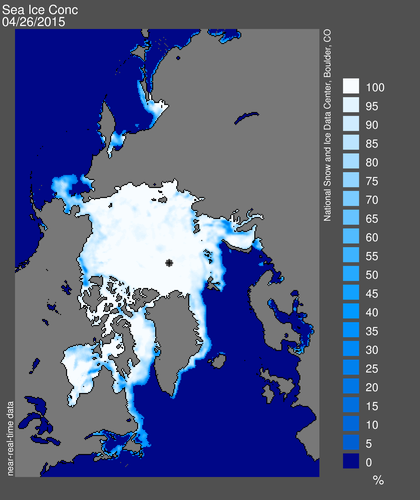 The findings showed significant contributions from warm rivers to rising sea surface temperatures and sea ice melt during recent Arctic summers including the record melt year of 2012. 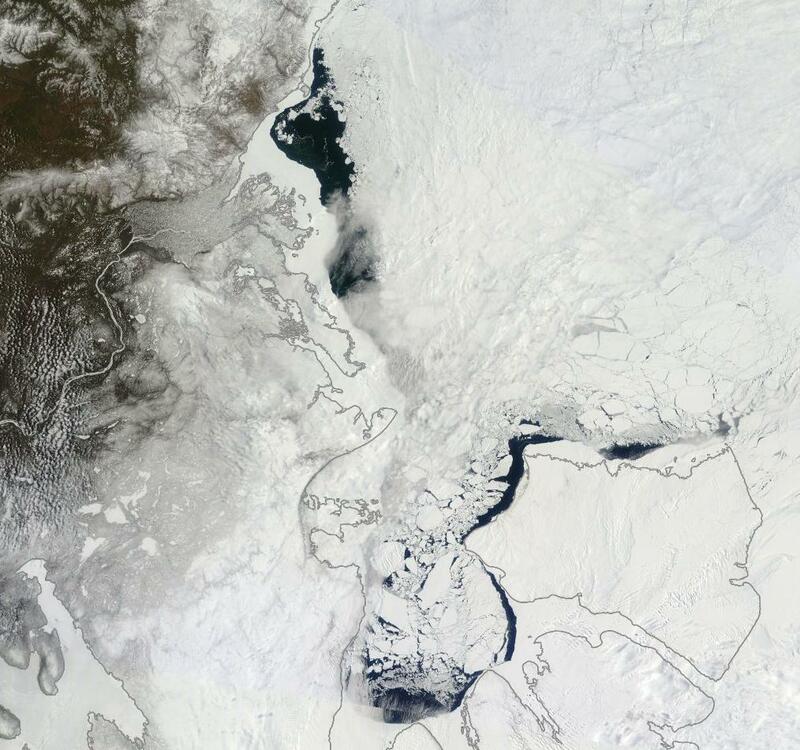 As the Arctic experiences increasing pulses of summertime temperatures during late winter and into spring, it is likely that warm water discharge and overall warmth will play a role at the transition between sea ice freeze and melt season. And this thought brings us back to Russia which appears to be stuck in the abnormally warm pattern covered above. 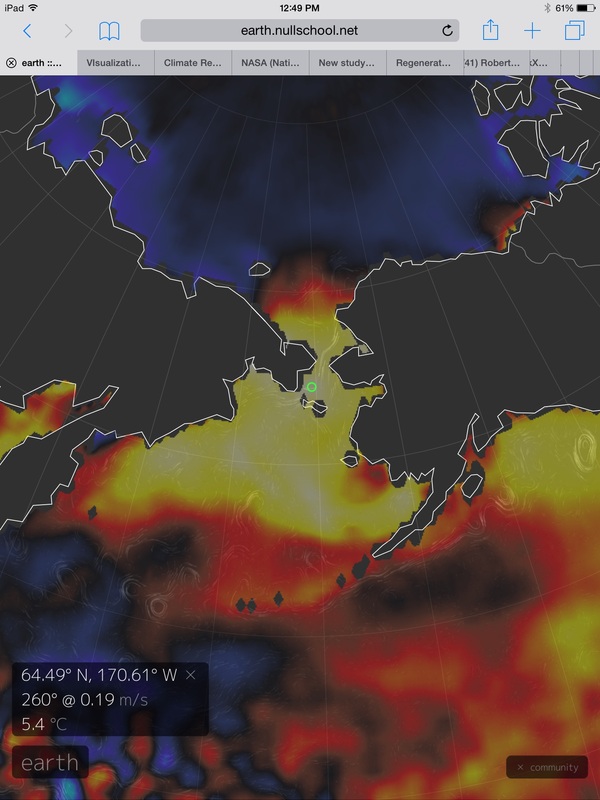 A pattern that, should it continue to flicker and swell, may well bring a surge of warmer than usual water into the Kara, Laptev and East Siberian Seas come later this spring and on into summer. 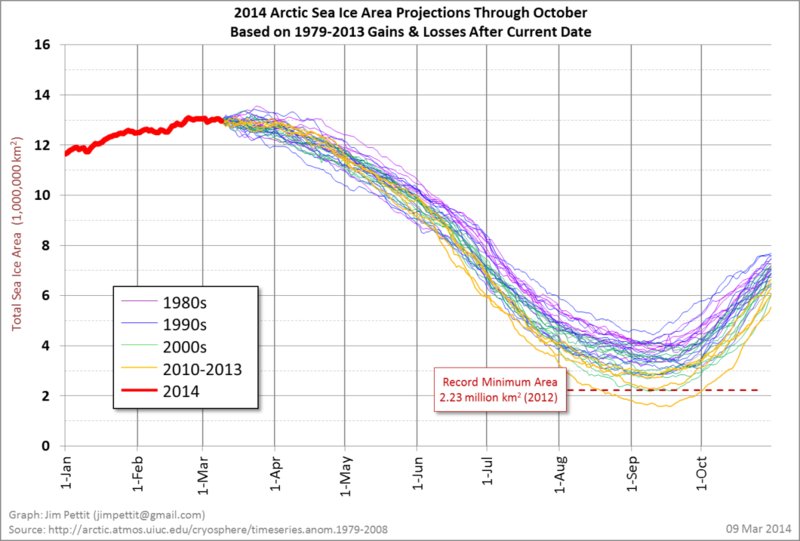 A blow to sea ice that may well emerge but that we can ill afford.